This article deals with the transition from running comparatively modest distances like the half marathon, to running the full marathon. It is a mix of the coach’s perspective and the personal experience of a few runners who recently did their first full marathon. This is not a training manual. It is a compilation of observations and experiences. At the expo preceding the 2018 Tata Mumbai Marathon (TMM), a group of monks from the Coimbatore-based Isha Yoga Centre, awaited their turn to collect bibs for the run. 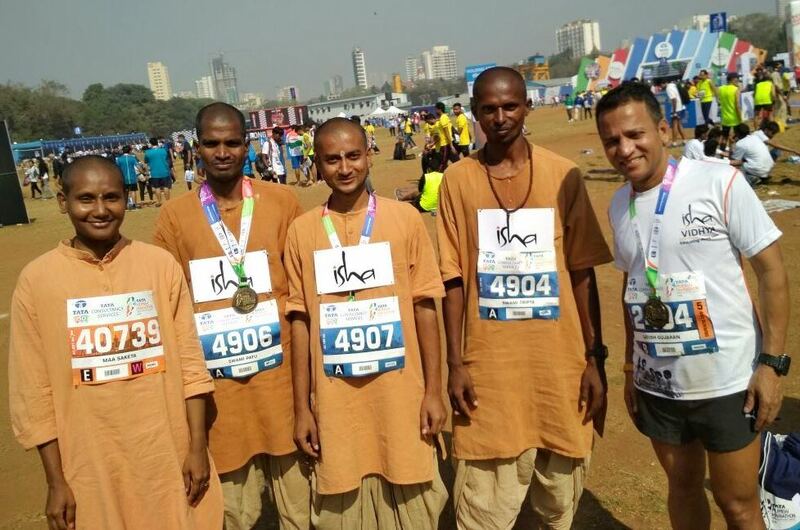 Young and dressed in saffron kurta and dhoti, some of them were transitioning to the full marathon after having run the half marathon for a couple of years. It wasn’t entirely their choice. One reason attributed for the transition was that slots for the half marathon filled up fast and the only option available was enrolling for the full marathon. Enrolment for TMM typically opens up in the latter half of July. Slots for the half marathon are prone to getting filled up within a week; entry to full marathon stays open for a longer period. TMM is among Asia’s biggest marathons in terms of participation; away from heavily attended segments like the Dream Run, meant to endear the event to its home city, the half marathon sees the most number of runners. The progression to full marathon (distance of 42.2 kilometres) from half marathon (distance of 21.097 kilometres) must rest on real reasons, running coaches aver. According to Satish Gujaran, Mumbai based-ultramarathon runner, who the team from Isha Yoga Centre looked to as coach and guide, the monks had a generally high level of fitness. That attribute weighed in when the team eventually decided to attempt the full marathon. Suchita Varadkar, Mumbai-based coach, is often seen encouraging her wards at major running events. Sometime in the late 1980s, while still in college, she did a teacher’s training course in yoga, thereby making her foray into the world of fitness. Running, she said, is a workout entailing much impact. A marathon involves running for a long period of time and that means putting the body’s joints at risk. “ Therefore, the prime focus should be health,” Suchita, who was an athlete before she turned coach, said. With emphasis on sports limited at most schools and colleges, many Indians living in these times of running’s ascent in the country, get exposed to sporting activity late in life. Consequently running a marathon can be quite challenging. Planning followed by systematic training should preferably commence a year ahead of the event, coaches we contacted, said. Mumbai-based marathoner Ashok Someshwar has been running for several years. A podium finisher at some events, Ashok believes the right way to progress would be to start with running five kilometres and then graduate to tackling 10 kilometres. “ It would be nice to participate in events featuring these distances frequently as the distances are not too long and recovery is faster,’’ he said. Once this process has been pursued for a year, training can commence for 10 milers (16 kilometres) and the half marathon. “ To be good at running a half marathon, it takes a few years. It would be advisable to continue running half marathons for at least two to three years. This should be combined with regular five kilometre and 10 kilometre-runs so that it is possible to set a target for the half marathon. Once a person has done half a dozen half marathons and is really comfortable with the distance – by this I mean racing and not just running – then, he or she is ready to plunge in to the full marathon, if and only if half marathons are finished comfortably,’’ Ashok said. According to Suchita, the progression should largely depend on fitness. However she added that there are runners, whose graph is quite sharp; they are able to shave off minutes, race after race. She pointed out the example of endurance athlete Chitra Nadkarni. For recreational runners, running a marathon is an activity spanning a few hours. For this reason, running a marathon requires not only cardiovascular endurance but muscular endurance as well, Suchita said. Strength training with special focus on glutes and core is imperative. “ Ideally, a marathon should be completed within five hours. Running for any period beyond five hours is exposing oneself to too much dehydration, especially in Indian weather conditions,” Suchita said. In fact, according to some coaches, while a marathon may be only double the distance of a half marathon, the effort required is nearly four times. Ashok’s journey to running long distances started in 2006 when he did his first half marathon at the Standard Chartered Mumbai Marathon (now TMM). 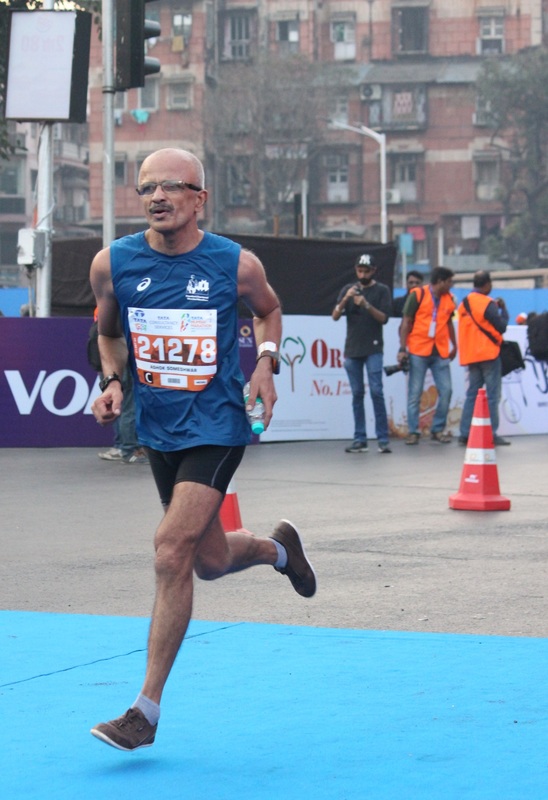 He moved to full marathon after five years of running SCMM. Some of the friends he was training with had been running the full marathon. He was soon drawn to the idea of running the distance. “ I had been trekking for long and walking long distances was always a part of my life. This made me attempt the full marathon,’’ he said. Ashok drew up a plan with the help of coach, Daniel Vaz, who has been his mentor for a long time. He followed the plan diligently. “ I started training for the full marathon almost one year in advance for mileage-building and then followed a strict plan for six months. I followed most of the rules of training. However I was a bit short on sleep due to office commitments,’’ Ashok said. At the time of writing, he had been running full marathons for seven years, interspersing it with half marathons and 10 kilometre-runs. A seasoned runner, Satish was keenly aware of the preparation needed for a full marathon. With the Isha Yoga Centre team suddenly staring at the prospects of running a full, he had to foment a decision. “ I was at the ashram for only two days and during that time I provided them tips on how to train for the marathon. Later I guided them remotely. But they didn’t have adequate time to spare; they hadn’t also trained formally for sports earlier. What they did have going in their favour were two other factors – they were young and their fitness level was high. I felt they could try the marathon,’’ Satish said. When we met them at the 2018 TMM expo, Swami Lavana and his colleagues from Isha Yoga Centre expressed their eagerness to attempt the full marathon for the first time. Born Raghavendra Anisetty, Swami Lavana had initially secured his mechanical engineering degree and found employment at Toyota Kirloskar Motors. Six months later, he resigned and proceeded to do the Inner Engineering course from Isha Foundation. Moving deeper into the subject, he eventually became a monk at the Centre. 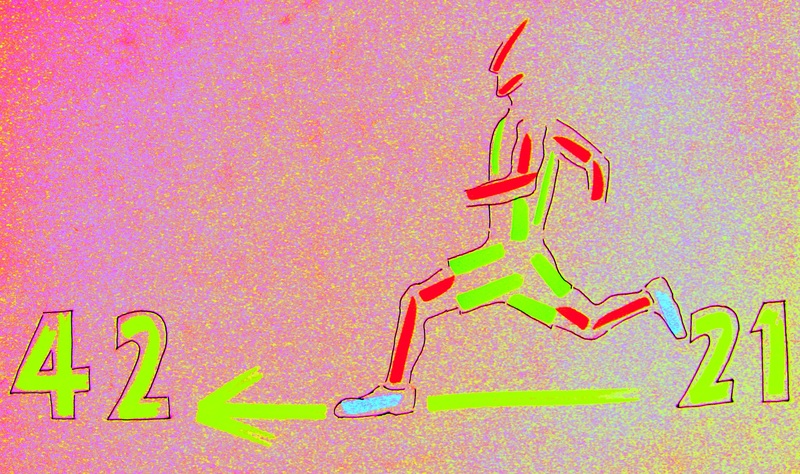 For most runners, transitioning to the marathon from shorter distances is logical next step. Mumbai based-Deepa Raut commenced running in 2014. Training sporadically, Deepa just went along with the flow. In her third year of recreational running, she was hit by the full marathon bug. From idea to actual event she had sufficient time to train systematically. In 2018 she chose to skip TMM and instead enrolled for the Standard Chartered Dubai Marathon, which is usually held five days after the Mumbai event. She trained under runner and triathlete Vivek Menon, who drew up a schedule for her based on her pace at previous running events. “ The first month of training was entirely focused on discovering my capacity,’’ Deepa said. She diligently followed Vivek’s plan, which incorporated speed workout and tempo runs. As her training progressed, Vivek kept tweaking the plan to push her limits. “ I guess I was able to push my limits because I used to be good in sports in school days,’’ Deepa said. Although coaching Deepa, Vivek’s trajectory was tad different. He has been running for seven years. 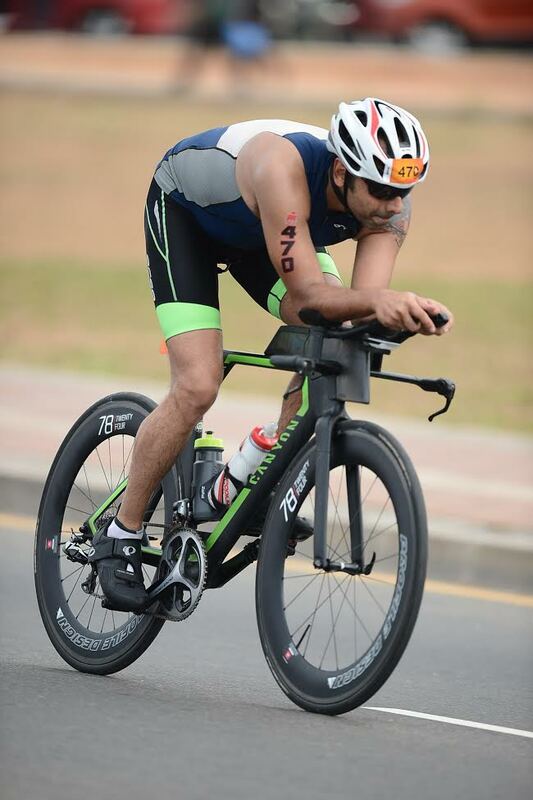 From regularly running the half marathon, Vivek chose to move to the triathlon. “ It’s never about doing big distances. Finishing strong is key,’’ he said. Vivek figured that training for the full marathon is relatively tougher and more intense compared to the Half Ironman (triathlon). Nevertheless, he decided to attempt the full marathon at the Standard Chartered Dubai Marathon on January 26, 2018. He had also decided to participate in a Half Ironman at Colombo on February 25. Managing the training for both these disciplines entailed an extremely packed schedule. He switched between swimming, cycling and running. Strength training is integral to marathon training. Prone to injuries, Vivek opted to do pilates. Juggling all this amid regular Mumbai life isn’t a joke. Deepa’s strength training fell short of actual requirement. “ I could manage only 20 per cent of the required strength training,’’ she said. Lowering body weight to the requisite level is critical for marathon training, Vivek said. Nutrition assumes importance. With wear and tear being high in marathon training, eating the right food is absolutely critical, Suchita said. Carbo-loading is important and at the same time some amount of protein – be it plant protein or animal protein – should be included in the diet. Also, snacking should be healthy. “ Any diet adopted, has to be sustainable,’’ she said. In that endeavour, cutting out refined sugar is the fastest way to drop weight and it helps in reviving energy levels, Vivek said. He also chose to stay away from parties to keep off alcohol as it can mess with sleep and hydration. Managing a full-time job, son and home, Deepa had a tough time time in this department too; she was not able to perfect her diet. For Swami Lavana, attention to nutrition was impossible as he cannot decide his meals at Isha Yoga Centre. Training for the full marathon takes away much of one’s personal time, Vivek and Deepa, both first time marathon runners, said. If structured training is critical to participate in the full marathon, tapering is equally important, Suchita reminded. During the tapering period, weekly mileages are lowered to the extent of 10-15 per cent and there are no tempo and speed runs. This helps recovery. At the start line of 2018 TMM, Swami Lavana was a bundle of excitement. “ My run started quite well. I was running fine till around 30-31 kilometre-mark. My pace was in line with my practice. But after that I started to feel discomfort in my thigh muscles and left knee. My pace then started to drop,’’ he said. He had to resort to doing stretches along the way. “ But in the last kilometre there was a different level of energy with all the clapping and cheering. That prompted me to sprint to the finish line,’’ Swami Lavana said two weeks after TMM. 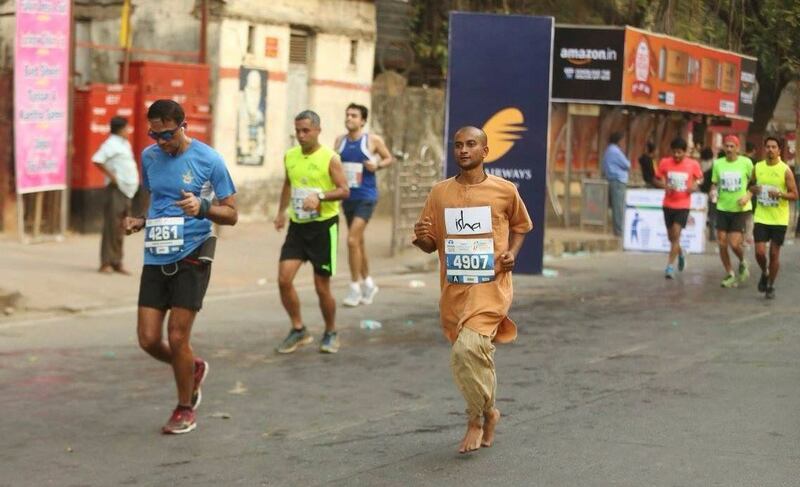 He completed his first marathon in 4:27 hours, running the distance barefoot, clad in monk’s attire of long kurta and dhoti. “ There was some fear about running 42 kilometres before the run. But once I started, I found the experience so wonderful,’’ he said. His colleague, Swami Patu, completed his maiden marathon in a time of 3:48 hours. Having completed his first marathon, Swami Lavana now sees value in focussed training. With limited time on his hands, he will have to find ways to train. For Swami Lavana, running in monk’s attire has not been an issue. If it rains during a run, then running becomes a problem as wet clothes weigh you down, he said. Deepa trained as best as she could for her maiden marathon. Still no matter how well runner plans, race day takes its own course. At 7 AM when the run commenced, temperatures in Dubai were around 14 degrees Celsius. “ Till about the thirteenth or fourteenth kilometre I was sleepy. My ears were shut because of the cold. Unexpectedly, the temperature shot up to 25-27 degrees Celsius by around 9:30 AM,’’ Deepa said. 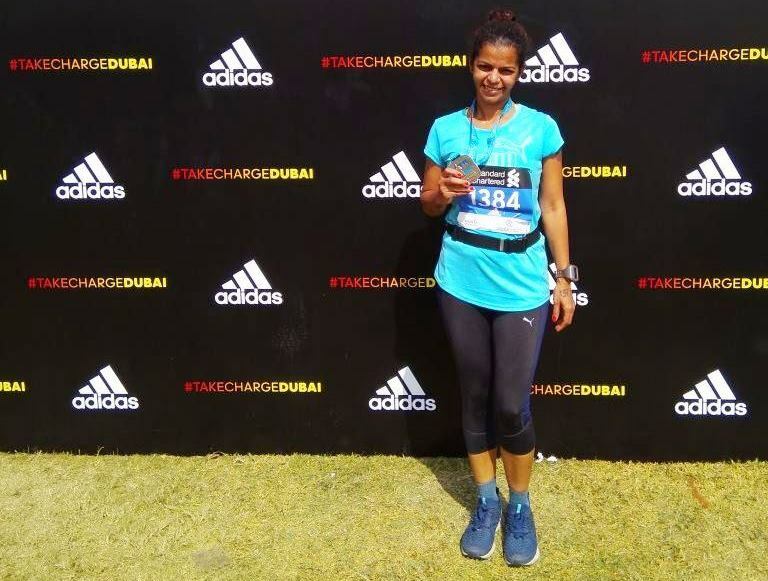 Up to the thirtieth kilometre, Deepa ran along with Darshita, a Dubai-based runner, who was also running her first full marathon. “ She was the one who pulled up my pace but after the thirtieth kilometre she started getting cramps. I decided to go along with her to ensure that she completes her maiden full marathon. Had I gone ahead, she would have quit the race,’’ Deepa said. Deepa finished in 5:23 hours, tad outside her target of five hours. In the run up to the Dubai marathon, Vivek had trained well. He also helped other runners with training plans. But a week prior to the Dubai run, he broke his elbow. He could not straighten his arm. “ I had trained so much. My flight and stay were all booked. I decided to go along and see what I could do,’’ Vivek said. Running is done with the legs. But in the overall action of running, the arms play an important supportive role. We instinctively move our arms as we run. Vivek had his doctor put his arm in a cast before he left for Dubai. “ In Dubai, I commenced my run at a controlled pace. But around 12 kilometres my arm started to ache. It was way too early in the race. By the 21 kilometre-mark, it was too much to manage. Also, given sweating my cast started to get heavy. I stopped at an ambulance to see if the cast can be removed but the staff inside the vehicle did not have a cast cutter,’’ he said. At the 26 kilometre-mark, Vivek seriously contemplated DNF (Did Not Finish). Weighed by cast and his running form affected as a result, new problems set in. “ Because of the imbalance in my running my right ankle started to give me trouble,’’ he said. From this point onwards, Vivek resorted to a mix of running and walking. He finished the run in 5:01 hours, against his target of sub-four hours. Sometimes you hit your first full marathon en route to attempting something much longer. Endurance athlete Chitra Nadkarni is a podium finisher at most runs she has participated in, in India. Her recreational running career commenced in 2012 and in 2013 she attempted her first half marathon in Hyderabad. She then started thinking of doing Comrades, an ultramarathon of around 89 kilometres in South Africa. 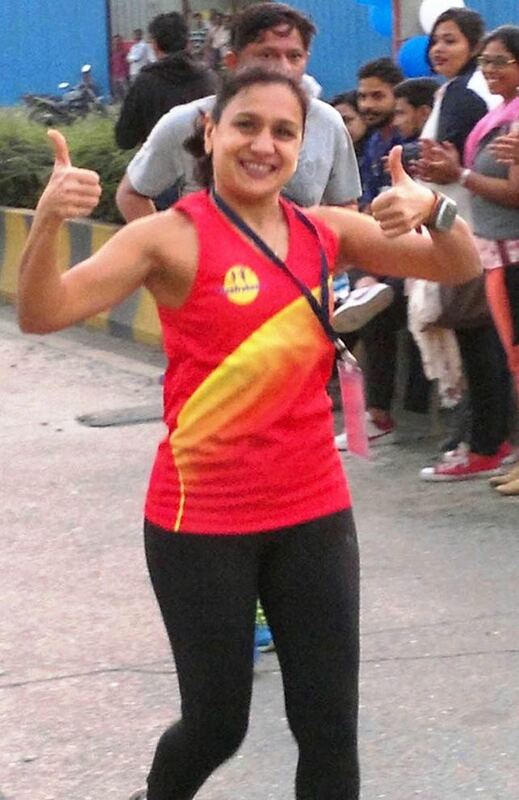 Even as she was training for Comrades, she ended up running her first full marathon in Amsterdam following it up with the full marathon at the 2015 Mumbai Marathon. “ Training for Comrades helped me do the full marathon,’’ she said. Once she finished her Comrades in mid-2015, Chitra started focusing on diet. She wanted to move on to the Half Ironman (triathlon) and realised that she was falling short in strength training. A full marathon, according to her, is very challenging. “ Mentally, it takes a lot and you are alone on the road for that distance,’’ she said. Many recreational runners opt to move to ultra-distances from having attempted the half marathon, skipping the full marathon in between or running it during the journey to ultra. By no yardstick does that dilute the challenge in a full marathon. The combination of full marathon distance and the need to complete it in respectable timing makes the full marathon an engaging problem to sweat over. Running a full marathon within a stipulated time frame can be quite challenging, runners we spoke to said. Hence – the need to tackle that progression, slowly, steadily.